Good Morning! And welcome to another great #MorningWithMeloni! Live every day in studio is our Host, Jamie Meloni for #ThatBusinessShow! Here at the show, we work bright and early to bring onto the #MorningAir the people that make a difference in the community, have a success story to share, or have a great product to pitch! With a clear mission to promote our local community, we make an effort to #HelpOurCity! If you would like to come on the #MorningAir to promote and showcase what it is that you do, then head to http://www.tampabayradio.com and fill out the contact form! Or, you can contact us directly by emailing christian@tampabayradio.com! Coming on #ThatBusinessShow first was our lovely Co-Host, Stella Guidicelli, joined by her colleague Sharon Deegan! 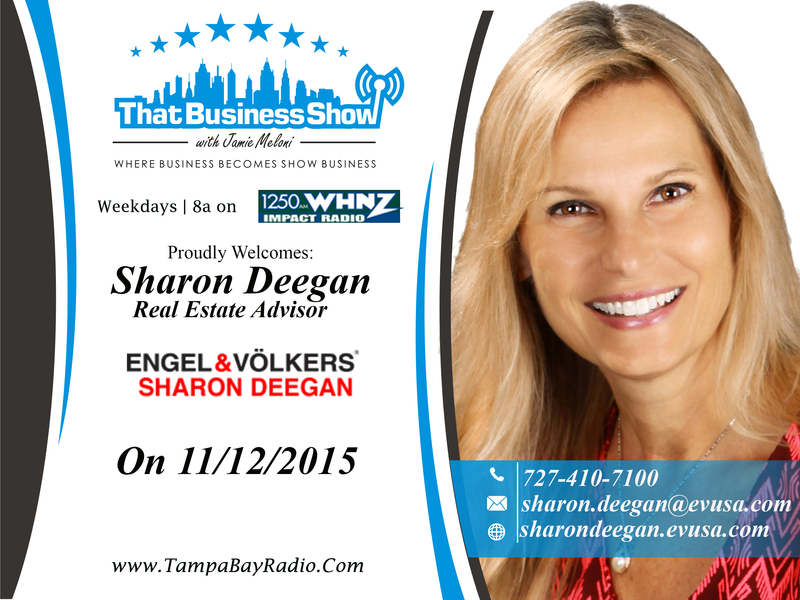 Sharon is a certified Real Estate Advisor with Engel & Volkers! 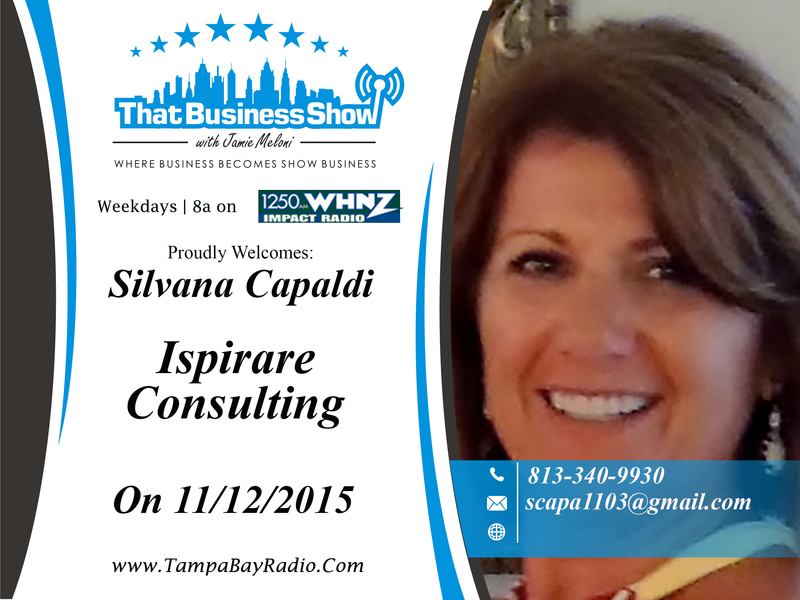 Coming on the show on the last segment was Silvana Capaldi, Founder of Ispirare Consulting! If you missed today’s episode of #ThatBusinessShow with Jamie Meloni on #1250WHNZ every weekday at 8am, head to http://www.tampabayradio.com to catch any show on demand! Alternatively, head to Jamie’s YouTube Channel athttp://www.youtube.com/jamiemeloni! Coming on our last segment was Silvana Capaldi, founder of Ispirare Consulting! Driven by Results, proven to improve organizations, spearhead change, and execute innovative and sustainable initiatives, Silvana is your go to professional to enhance your business! Helping entrepreneurs with starting up their businesses by discussing ideas, formats, and more, Silvana can help your business take off and excel! Working with professional service organizations and business to provide business consulting and marketing, and Inspiring companies to achieve and excel to their maximum potential – don’t miss out on Silvana Capaldi with Inspirare Consulting – if you missed Silvana, head to http://www.tampabayradio.com or http://www.youtube.com/jamiemeloni to listen to #ThatBusinessShow on demand! For more information on Silvana Capaldi and Ispirare Consulting, email Silvana at scapa1103@gmail.com! This entry was posted in Articles, Business, Entrepreneurship and Business, Work and tagged blog, business, consulting, interview, radio, show business, work. Bookmark the permalink.